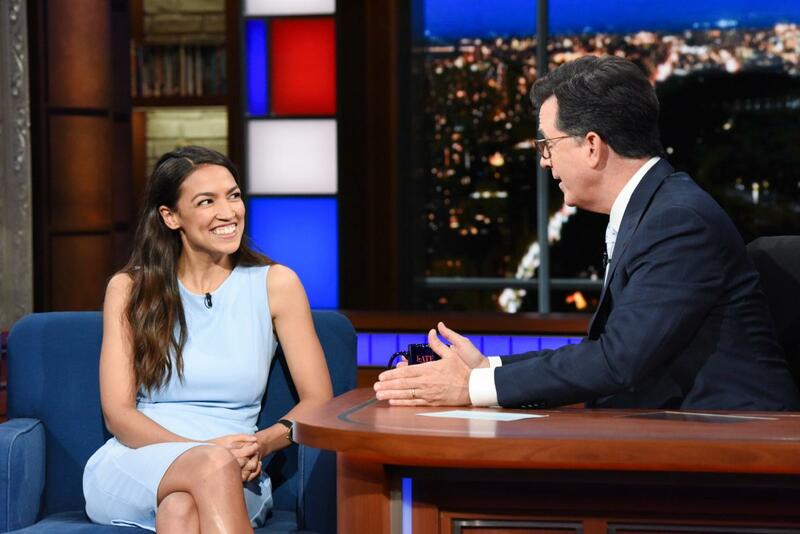 Alexandria Ocasio-Cortez, the 28-year-old woman who defeated powerful Democratic Congressman Joe Crowley in one of the most shocking upsets so far of the 2018 primaries, appeared on the "Late Show" on Thursday with Stephen Colbert. She talked to Colbert about her reaction after winning as a first-time candidate in New York's 14th congressional district and about what her support for democratic socialism means. She described the moment she learned about her win at her election-night watch party. "It was an old billiards hall in the Bronx," Ocasio-Cortez said. "I hadn't checked any of the polls on my phone, and we get out, and I go, 'Oh my God' outside because I see all these reporters running to the watch party. ... I'm literally racing these reporters into the billiards hall, and I run inside, and I just run to this TV set and I look up and I see the margin, and then I see the amount of precincts reporting. And that's how I found out that we won the election. Right there in that moment." Colbert asked her more about her platform and democratic socialism. "I believe that in a modern, moral, and wealthy society, no person in America should be too poor to live," she explained. "What that means to me is health care as a human right, it means that every child no matter where you are born should have access to a college or trade-school education if they so choose it. I think that no person should be homeless if we have public structures or public policy to allow for people to have homes and food and lead a dignified life in the United States." When asked about President Trump's gleeful reaction over Crowley's defeat, tweeting that Crowley was a "big Trump hater" who should have been "nicer" to his president, Ocasio-Cortez said Mr. Trump shouldn't count on her support. "The president is from Queens," Ocasio-Cortez said. "And with all due respect—half of my district is from Queens—I don't think he knows how to deal with a girl from the Bronx." During her victory speech, Ocasio-Cortez, a Bronx native who graduated from Boston University, said, "We meet a machine with a movement, and that is what we have done today. Working-class Americans want a clear champion and there is nothing radical about moral clarity in 2018."